Happy 6th Sunday of Easter! If you ever feel distressed during your day, call upon our Lady, just say this simple prayer: ‘Mary, Mother of Jesus, please be a mother to me now.’ I must admit, this prayer has never failed me. And so we may hope that those who meditate upon the glorious example Mary offers us may be more and more convinced of the value of a human life entirely devoted to carrying out the heavenly Father’s will and to bringing good to others. Thus, while the illusory teachings of materialism and the corruption of morals that follows from these teachings threaten to extinguish the light of virtue and to ruin the lives of men by exciting discord among them, in this magnificent way all may see clearly to what a lofty goal our bodies and souls are destined. 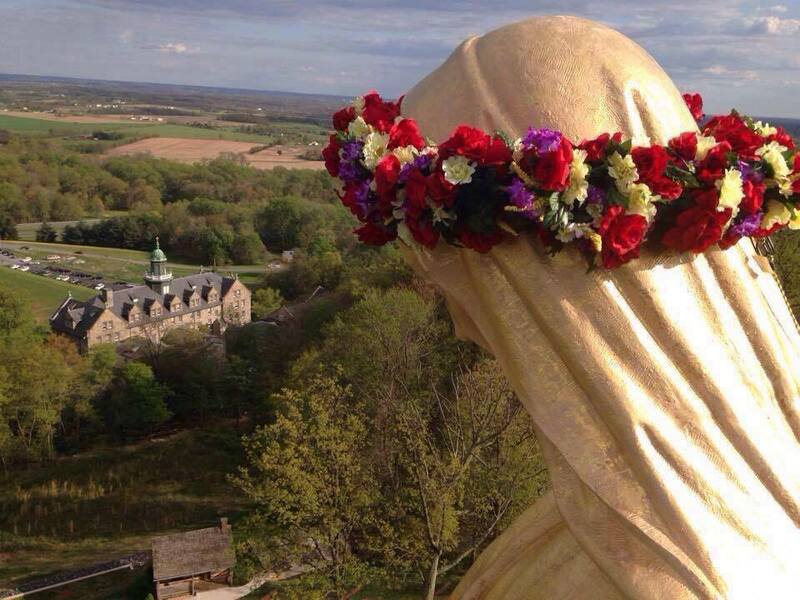 Statue of the Blessed Virgin Mary atop mountain overlooking Emmitsburg, Maryland and Mount St. Mary’s Seminary.